Hiking is a pretty minimalist activity. You can really wear any normal clothes that you have and head out the door for a hike. This applies when you’re hiking on local trails at home, and it could work that way on your Hawaii vacation too! But, if you want to improve your comfort when out on the trails, here are a few things to keep in mind when you’re thinking about what to pack for your Hawaii hikes and what to wear hiking. This can apply whether you’re on hiking trails near home or on hiking trails when you’re traveling in Oahu, Kauai, Maui, or the Big Island! And in some cases this can help with your safety when hiking in Hawaii too. 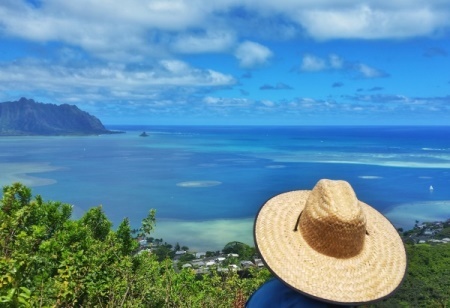 Because of the hot temperatures you’ll likely experience when hiking in Hawaii, you’ll want to think about it in terms of what to wear hiking in hot weather or what to wear hiking in summer. Here first is the quick list, at minimum, for what to wear on most hikes in Hawaii (and most hot weather hiking in general) that would be best or most ideal to put on your list of what to pack for Hawaii! And next, for a little more about each of these things for hiking in Hawaii! What is a moisture-wicking shirt? The moisture that’s being wicked away is your SWEAT! And hiking in Hawaii most likely means hiking in hot weather, so you will be sweating! That’s why wearing these types of shirts can increase your comfort on the trails. They tend to be better because they don’t absorb the water from your sweat as much, and they are made to dry quicker. If you wear cotton, that cotton material will very easily absorb that sweat. So for your hiking adventures, be sure to look for moisture-wicking shirts like these for women and like these for men. You want to hike in comfort, and one of the best brands for hiking shorts is from one of the best brands for outdoor gear! Have a look here for women, and here for men. Having some sunscreen handy so you can reapply it as necessary is a good idea. Although it will depend on which trail you’ll be hiking. You may not need to worry as much about reapplying sunscreen if you’ll be on a mostly shaded trail. What shoes to wear hiking in Hawaii? There is a good chance that if you hike a popular trail in Hawaii, you will see at least a few people wearing flip flops on the trail. This is really not a good idea, and this is one thing you really should not wear hiking in Hawaii! 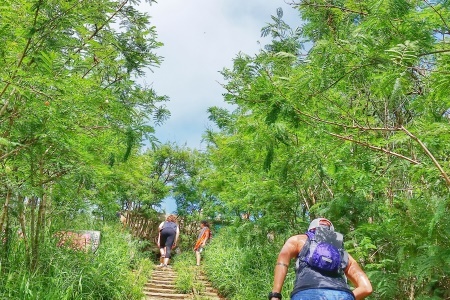 Most trails in Hawaii have at least some portion with conditions in which even shoes with a good grip may cause you to slip a little. Many trails have a good portion of loose dirt and gravel. This can make for better conditions to lose your footing more easily. When you wear regular street shoes or beach sandals on the trail, you just increase your chance of having a fall. 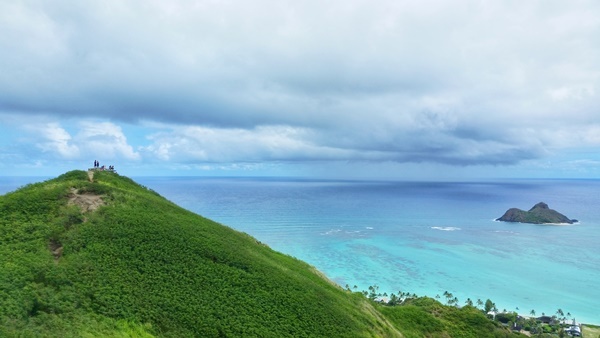 In many cases, a slip could just end with you on the ground with an extra bruise or two, but some Hawaii hiking trails have steep drop-offs in which you definitely do not want to be slipping! It’s just safer to have shoes or sandals with traction. That’s why it’s a very good idea on pretty much all hiking trails in Hawaii to wear shoes that have better grip like these for women and like these for men. If shoes feel hot to you in Hawaii, there are also hiking sandals that are designed with better traction, like these for women and like these for men. Here’s a list of top brands for hiking sandals. Remember that it’s important to break in your shoes before you go out and hike for several hours in them, so be sure to wear them here and there before you head off to Hawaii. The idea behind wearing breathable socks when you’re hiking is pretty similar to wearing a moisture-wicking shirt when you’re hiking. They are meant to keep the sweat issue to a minimum. Now, socks may not work as well as shirts because your feet are more trapped than your upper body. But, don’t you want to help your feet out a little bit anyway? So be sure to wear performance socks like these to give your feet a little bit more breathing room from that sweat. Similar to the sunscreen, this may more or less depend on how sun-exposed the trail you’ll be hiking is. Go for a sun hat with a neck cord so you have a way to keep your hat from flying away if you end up on an open portion of a trail that’s really windy. Have a look here for women and here for men. This will again depend on what type of trail you’ll be hiking. If you’ll be hiking a more tropical jungle type of trail, or if you’re hiking after it’s rained, you may want to consider packing that bug repellent so you can wear it out on the trail. For travel-oriented bug repellent, see these wipes. Unfortunately, wearing both sunscreen and bug spray together may not work out so well because each may counteract the other. See here for the explanation. In some areas of Hawaii, you can unexpectedly be hit with rain when you are out on the hiking trails. If you don’t want to end up wet and miserable 😉 it wouldn’t be such a bad idea tohave a lightweight rain jacket like one of these. Or if Hawaii is the only place you’ll be needing a rain jacket, you can also try to head to the camping section of your local Walmart. You may be able to find a disposable poncho for $1. This can be a low-cost option so you can have rain protection just in case. This packing list for Hawaii can work for many trails in Hawaii, but may not be for all, depending on trail conditions of any particular trail. For example, if you’re off hiking at Volcanoes National Park on the Big Island, it could be a good idea to wear long pants that give you more coverage than shorts, as a safeguard against slipping and falling. If you slip and fall when you’re on a majority of Hawaii’s popular hikes that are dirt trails, you might get a little dirty and a few bruises. If you slip and fall on a hike at Volcanoes National Park, or even just get out of your car to take a short walk to an overlook, there’s a chance that you can slip and fall onto lava rock, and that might hurt a bit more! The pants can give you at least a slight barrier between the lava rock and your skin. The National Park Service says that falling on lava is like falling on broken glass! Take a look at lightweight and breathable hiking capris like these or for longer leg coverage with hiking pants like these. These pants may also have UV protection too. Potential accidents are also why you might want to take a travel first aid kit like this one, or pack ointment/neosporin and different sizes of bandages in a ziplock bag. Although, packing a first aid kit is good practice no matter where you’re hiking! Whether or not you want to wear a backpack may mostly depend on how long you’ll be out hiking for. But even for an hour hike, it could be a good idea to carry a backpack. This is to be prepared in case you end up out on the trail for longer than you expected. For backpacks that are on the more affordable side, have a look here. For durable long-lasting backpacks with a good reputation for outdoor gear (that are worth the price! ), have a look here. Save the best for last. 😉 Most important, anyway! If you want to be hands-free when you’re on those Hawaii hiking trails, it actually does make sense to wear your water. AND it can be a better way to make sure to stay hydrated too! Hydration packs make it super easy for you to drink water without a second thought. This means that it makes it easier for you to keep adding that necessary water to your body. You will be sweating more than you realize, so water is SO important! There’s a good chance you’re not used to the tropical heat too, which makes it even more important! Now, if being hands-free isn’t much of an issue for you, you will probably see lots of people carrying these types of water bottles. Especially if you plan to go on shorter popular trails in Hawaii, you will probably see at least a few people with this kind of water bottle! They are expensive though, so what’s the deal?! People hiking in Hawaii love them because of the amazing insulation. They keep cold drinks cold and hot drinks hot for longer. Have a look. But that water bottle can be heavy too. A water bottle that’s lighter and travel-friendly is this one. You may even want to pack it in your carry-on luggage so you can fill it with water at the airport and on the plane. Otherwise, it makes it so you can easily roll it up and pack it in your suitcase so it doesn’t take up much space at all when you’re not using it.